Basic scheme of an optical tweezer-based sensor of biological particles. A microsphere covered with a specific antigen (such as a virus or other infectious agent) is trapped and pulled away from a surface containing the corresponding antibodies. 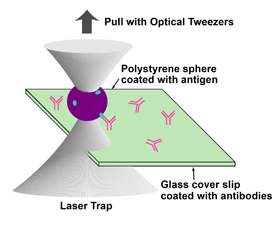 The minimum amount of force applied to the tweezers to break the bonds can provide information on the concentration of antibodies on the surface. Cutting-edge "tweezers" are so sensitive that they can feel the tell-tale tug of tiny concentrations of pathogens in blood samples, yet don't ever need to be sterilized—or even held—as they are ephemeral and weightless. The National Institute of Standards and Technology (NIST) has licensed a patented "optical tweezers" technique for detecting and measuring very small concentrations of a biological substance—such as a virus on a surface. NIST has issued a non-exclusive license for the technology to Haemonetics, a global health care company that provides blood management technologies for hospitals and blood and plasma collection agencies. Optical tweezers are actually tightly focused laser beams. They can trap certain objects, such as latex microspheres or biological cells, and move them around in water. This occurs because the lasers' electric fields interact with electric charges on the objects. To detect disease-causing agents, researchers can coat a microsphere with antibody particles and then touch it to a surface containing infectious particles (antigens). The antigens then stick to the antibodies on the sphere, reminiscent of Velcro, in which loops on one strip combine with hooks on the other. By determining how much laser power is required to pull the microsphere away from the surface, one can then calculate the amount of force needed to break off the antibodies from the antigens and thus count the number of individual antigens that were bound to the sphere. This in turn can detect and count biological antigens at extraordinarily low "femtomolar" concentrations—roughly equivalent to one antigen particle per quadrillion (1,000,000,000,000,000) water molecules. Following up on earlier work in optical tweezers in the industrial and academic research communities in the 1970s, the licensed technology was patented in 1997 (patent #5,620,857), as a result of research conducted under the NIST BioSensor Consortium. The inventors are Howard Weetall (since retired), Kristian Helmerson, and guest researcher Rani Kishore. For more information on these or other NIST technologies, should contact Terry Lynch, NIST Office of Technology Partnerships, , (301) 975-2691.